At karaoke night, a supportive group of friends can pretend to love your mediocre cover of George Ezra’s “Budapest” because they aren’t comparing you to a professional. In the field of comedy, though, the expectations are a lot higher. Even slightly fumbling the delivery can completely butcher a joke, turning a roaring sea of laughs into an empty, uncomfortable silence. I walked into the third annual Spoke Comedy Night at Harland Cinema on April 5 with a bout of secondhand anxiety for the mostly amateur comedians performing. After all, if you have ever tried your hand at comedy, you know that it is very difficult to actually be funny. The event was a series of independent stand-up performances. 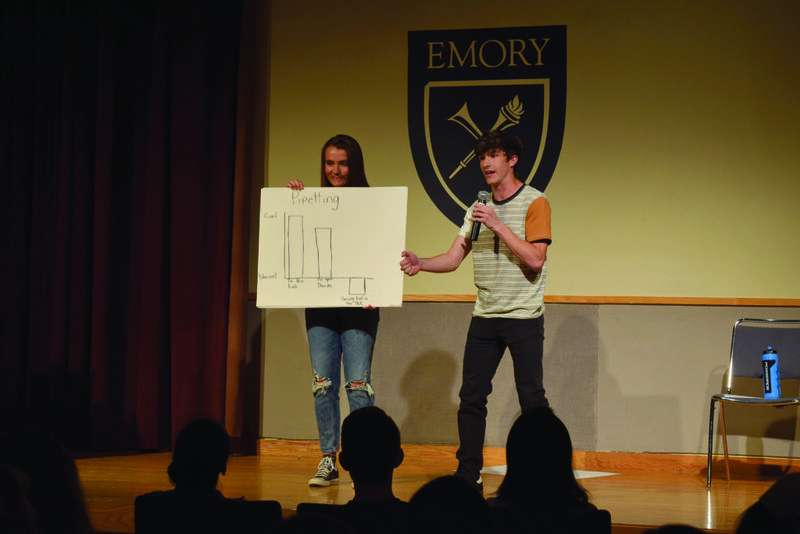 The Emory Spoke’s Co-Editor-in-Chief Arianna Newhouse (19C) hosted the event, introducing each act and hyping up the crowd of about 30 people. Newhouse got the show running by introducing the first comedian, Liam Fost (21C), who used charts on a large sketch pad as the basis for most of his jokes. In his 10-minute performance, the jokes ranged from graphic conjectures of how people manage to mess up all-gender bathrooms, to graphs explaining the relationship between how cute a girl is and how irritating their internship-related spiels are. Fost admitted his set was “definitely under-rehearsed,” but he looked comfortable on stage and spoke confidently, which made for an easy-to-watch experience that assuaged my anxiety. If Fost’s piece thrived on how comfortable it felt, Jane Song (20C) succeeded exactly because she pushed the audience out of its comfort zone. In contrast to the more wholesome flavors of the other acts, Song was unapologetically dark, donning the persona of a socially conscious serial killer. Her slight stutters and nervousness, common of first-time comedians, were more than compensated for by the vivid, visceral imagery of her jokes. That said, after 20 minutes of lucid descriptions of farm-to-table cannibal restaurants, Morgan Levy’s (20C) innocent discussions of dealing with pain medication after tearing her ACL was more relatable than the equally admirable eccentricism of Song’s and Fost’s sets. Even when the audience wasn’t laughing, the stories she told embodied an anecdotal charm akin to that of Kumail Nanjiani. After an intermission, the show returned in full swing, spearheaded by a five-second performance by Camilla Makhlouta (20C), who asked a somewhat politically charged question: “f***, marry, kill: Dwight Ma, Dwight Ma, Dwight Ma.” The newly elected Student Government Association (SGA) president recently won the election on a campaign emphasizing communication between SGA and underrepresented groups, though this is probably not the type of communication he had in mind. Raya Machaca (17Ox, 20C) was a big hit with the audience, visible from the roaring applause before and after her set. Stories of her camping trips in Southern California were littered with beautifully measured, semi-ironic arrogance. She brought to light the audacity of listing perfectionism as a weakness, before she jokingly acknowledged how her “amazing personality” is one of her flaws. Next, Aaron Mamaril (21C) gave the audience an equally hilarious, self-deprecating 15 minutes. His detailed explanations of how he made a fortune setting up a casino in a daycare would make any business school student jealous. He ended his piece with an unprecedented, heartwarming explanation of the value of events like the Spoke Comedy Night, and how it allows a comedian to find solace in the thing they are best at: making people laugh. After Mamaril’s heartwarming monologue, the claps of appreciation turned into the ear splitting cacophony of supportive friends who were there for the next comedian: Zoe Eisenstein (21C). In a similar vein to Levy, she told personal stories about her family in New York. Like Machaca, there was a satisfying level of ironic self-indulgence, especially in her proud declaration of her status as a “homegrown elitist,” as opposed to fake elitists who are pompous just by virtue of being from New York. With everybody in stitches after Wright’s performance, the night came to an abrupt end. As Mamaril said earlier in his set, opportunities like Spoke Comedy Night allow student artists to cultivate their trade and become more confident. If you grow tired of binging comedies on Netflix, you might want to head to the next Spoke Comedy Night for some student-produced entertainment. Joanne Choi (20C), who attended the event, told the Wheel that the event introduced her to a new side of Emory. “I realized that there a lot of funny people [at Emory],” Choi said.